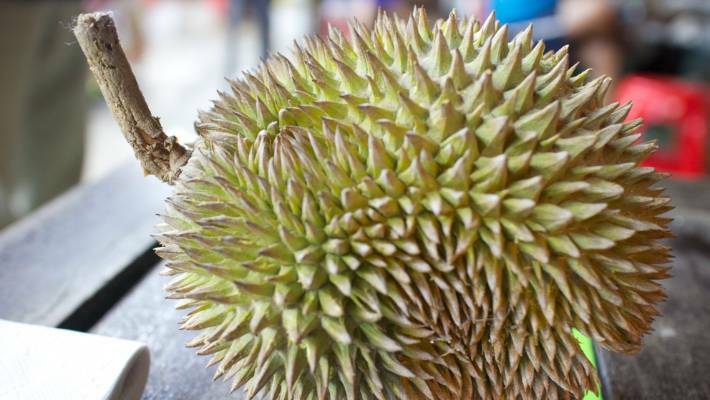 In some Asian countries, Durians are banned from public transport and hotels due to their pungent smell. However the airline agreed to remove the fruit, and passengers disembarked while it was offloaded. A Sriwijaya Air flight departing from Bengkulu, Sumatra, and bound for the capital Jakarta was delayed for a whole hour after passengers refused to take off if the rank fruit had to travel with them in the passenger cabin. The airline eventually agreed to offload the sacks of durian fruit from the cargo hold and the flight departed an hour later than schedule. Footage of the incident, uploaded to Facebook by a passenger named Amir Zidane, shows travellers milling around on the tarmac as aircrew unload the offending cargo, whose smell has been likened to rotten onions, turpentine and dirty gym socks. "He said he finally turned to his fellow passengers asked: "(Who) on the plane wants to fly?" They all chanted back, "not us!'". Responding to the incident, Pramintohadi Sukarno, acting director general for air transportation, said that "carrying durian, terasi (fermented shrimp paste), dried, salted fish and other stinky goods in a plane is not forbidden because they are not categorized as risky goods".